One of the first things we did while in Japan was to visit Yasutaka Daimon the owner and Toji of Daimon Shuzo. He is an incredibly nice and warm man who made us feel extremely welcome. During our visit I captured some video that I like but am a little embarrassed by. The quality and choice of where I was pointing and not pointing the camera could have been much better. Well, live and learn. I hope you find them interesting despite the quality. This first video begins while we are talking about the moisture content of the rice prior to steaming. Yasutaka-san says that they shoot for a moisture content of 32-33% for the rice that will be used to make koji and 28% for the rest of the rice, the kakemai (掛米). 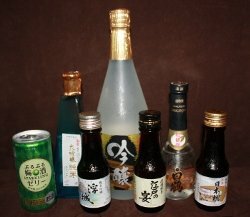 While in Japan I purchased a few sakes that I brought home; for the most part these were all small or tiny bottles. Anyway, I thought that you might like to see what I got. In addition to these, a friend from Kizakura Brewing gave me a bottle of their sake. It is the only standard size (720ml) bottle in the group. I’ll start with the Kizakura. This was a very thoughtful gift. 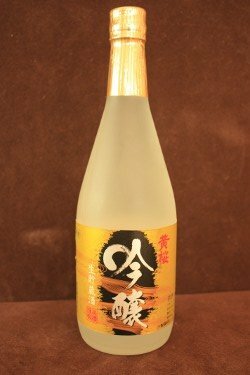 I had looked for sake from this brewery but had not been able to find one that had not aged too long. It is a brewery in Fushimi in the southern part of Kyoto. Hopefully as the industry here in the US matures issues like having old sake (that is not meant to be old) on the shelf will disappear.